We supply high speed decanter centrifuge for oilfield gas & oil drilling solids control system.Welcome to contact us to consult high speed decanter centrifuge. 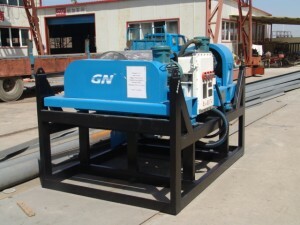 High speed Decanter Centrifuges are used to process unweighted and weighted, water-based and oil-based drilling fluids (muds). Mechanical energy is utilized to increase the gravitational force exerted on solids that are present in the mud system. high speed decanter centrifuges are able to apply over 3,000 G-forces on the liquid/solids mixture, which separates the heavier solids from the lighter solids. Additionally, high G-forces separate fine solids from liquid. mechanical separation of solids from the drilling mud purification system through the use of a high speed decanter centrifuge is a highly-effective means of maintaining proper mud weight and viscosity. When used in conjunction with other solids control equipment, high speed decanter centrifuges enable users to maintain the mud properties within the prescribed range as per the drilling program. Typically, decanter centrifuges are the final processing units in the arrangement of solids control equipment. They are preceded by gas busters, gumbo removal equipment (if utilized), shale shakers, mud conditioners (if utilized), vacuum degassers and hyrdocyclones. We are a China professional high speed decanter centrifuge manufacturer.